August and finally it's too hot to cook! Normally I wouldn't be so over-joyed about this but since we had an extremely mild, wet, bordering on cool summer in Philadelphia, I'm kind of happy about this change of weather. Collingswood Farmers' Markets and many CSA farm shares have again provided us with a bounty of tomatoes. I have canned over 16 jars, of varying sizes and flavors of salsa. I think that between the stash I've put up and the fact that it is too hot to stand over the canning bath of hot steaming water, it's now time to start thinking outside the stock pot. Before I could stomach eating a raw tomato, I would have NEVER wanted to make this dish. Now I can't believe I never made it before this past week! As much as I love a cooked, saute, stewed or sundried tomato, I could never appreciate or eat one raw. The texture just didn't appeal to me. Funny what a bit of acid, hot weather and need to eat my daily fruit and vegetables will do to change my eating habits. This is an almost no-cook, prep it and forget it recipe. You can choose to blanch the garlic, once again, to tame that raw bite. You will have onion breath however, it's the price to pay for this easy dish. Swish around some Scope or Listerine before you go to bed. The tomato cruda should be served over hot pasta - as the just cooked pasta will help to finish "cooking" the sauce and if you add it, melt the cheese. 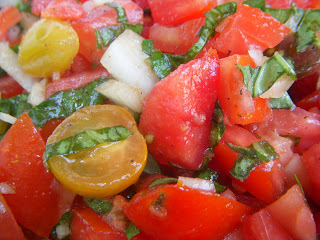 Think of this crudo as an Italian or Mediterranean style salsa. Embellish it with capers and/or olives. You can add Feta or Fresh Mozzarella Cheese. Top with a good Italian Tuna packed in olive oil, or grilled chicken or shrimp for a punch of protein. I served it over Trader Joe's organic, sprouted wheat pappardelle pasta - which by the way, is outrageously good and cheap! To keep this gluten free, you can also use vegetable noodles - raw, blanched or sauted. 1/2 Pound Dry Pasta of Choice - wide noodles work best or you can use Zoodles - partially cooked/sauted, or raw vegetable noodles. Prepare the tomatoes; wash, seed and cut into small dice or slice the cherry or grape tomatoes in half. Put into a non-reactive mixing bowl (stainless steel, glass or plastic). Set aside. Dice the onion and add to the tomatoes. Blanch the garlic for 2 minutes in boiling water. Cool and then mince or smash and add to the tomato/onion mixture. Season the tomato mixture generously with salt, freshly ground black pepper, the balsamic vinegar and olive oil. Stir to combine and cover with plastic wrap. Set aside, at room temperature for at least one hour up to 8 hours, stirring occasionally. When ready to serve, cook pasta according to package directions in a large pot of rapidly boiling generously salted water. Cook pasta until it its al dente. Drain, but do not rinse the pasta. 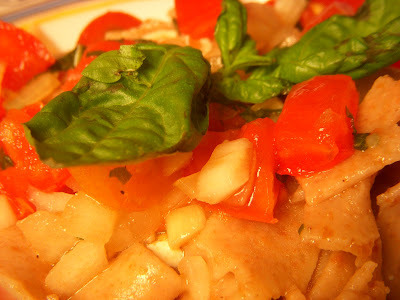 Immediately spoon 1/2 of the tomato cruda over the hot pasta and toss in the Feta or Mozzarella cheese (if using). Serve immediately with additional cruda spooned over the top of each pasta serving; top with protein of choice if desired. If using Zoodles or other Vegetable Noodles, you can saute them lightly; blanch them for 30 seconds in hot boiling water, or use them raw with the crudo sauce. I like to do a mixture of zoodles and pasta, letting the zoodles "cook" by adding them to the strainer/colonder then draining the pasta over the zoodles. It takes care of the cooking and you can use less pasta and amp up the vegetable quota!